I am sobbing in the Banana Lady’s arms. It is July 2008 – almost two years since I last found myself here in the rural village in central Ghana where I served as a Peace Corps Volunteer from 2004 to 2006 – and I am mourning the loss of my dreams. When I first arrived in the village I was lost. I couldn’t speak very much Twi, didn’t know anyone, and wasn’t sure how to start my projects. None of that mattered to the Banana Lady. She invited me to her house for meals, checked on me when I was sick, insisted on giving me free bananas everyday, and sat patiently as I tried to communicate in her language. Once my Twi skills improved, we spent many nights talking, playing with her grandchildren, and enjoying each other’s company. Even though I was always an outsider in the village, I was at home with the Banana Lady. After a few months, I began to call her Maame (Mom). It just felt right. No matter how tight our bond grew, I never shared one of my personal struggles with Maame. 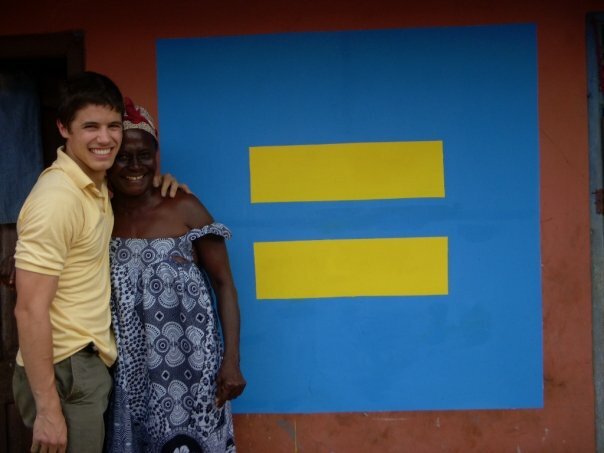 I joined the Peace Corps suspecting that I was gay, and with every intention of using my time in Ghana to come to terms with and accept my sexuality. After a year I came out to my fellow PCVs, who were supportive, and the Peace Corps Medical Officer, who advised me not to come out to any Ghanaians. She informed me that several LGBT PCVs who chose to come out to Ghanaians in the past had been molested or abused. That was enough to convince me to come out only to Americans. I spent the remainder of my service living the typical LGBT PCV double life, being open with Americans and closeted with Ghanaians. 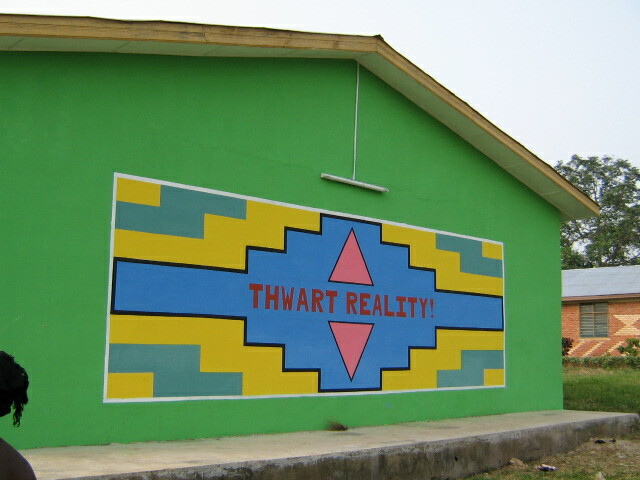 As time went on, I started having conversations with Ghanaians about LGBT rights, painted murals throughout the village featuring pink triangles and the Human Rights Campaign logo, and even flirted with a Ghanaian man who I thought, under a different set of cultural norms, might be openly gay. Even though I never came out to any Ghanaians in my village, I was pushing the envelope and life was good. When I completed my service I was sad but ready to move on. I said goodbye to the village and to Maame, but promised that I would return after completing graduate school in New York City. By that point, I had determined my long-term goals included living in West Africa and working for an NGO with an economic development mission. In my vision of my future, I would be back in Ghana frequently, perhaps permanently. Living and studying in New York City was everything I had hoped for. I fed my professional aspirations by diving head first into my studies of economic development, sustainable agriculture, and humanitarian interventions in West Africa. Meanwhile, I became the poster-boy for LGBT equality on campus; I led large-scale efforts to increase the university’s support of LGBT students and became involved in local and national advocacy campaigns. I loved being out, and displayed the rainbow flags and pins to prove it. When my graduate program offered me the chance to return to work and study in West Africa during the summer of 2008, I jumped at the opportunity. After two months in Burkina Faso, I traveled to Ghana to visit my Peace Corps village, where a large homecoming awaited me. Memories flooded back as villagers lined up to say hello, exchange hugs, and give me presents. Maame treated me like royalty, of course. At first, it felt like nothing had changed. Over the next week, though, the euphoria began to subside, and reality began to sink in. I had grown accustomed to living openly and honestly in New York City, and was now extremely uncomfortable being even the slightest bit closeted. Things that didn’t bother me during my Peace Corps service now hit me hard. Every time someone asked me, “Why don’t you have a wife?” I shuttered as I offered an incomplete and insincere response. I felt like I betrayed my dignity each time I wanted to mention my boyfriend, but didn’t. Suddenly, the idea of leading a double life again seemed completely impossible. My dream of living and working in West Africa was in conflict with my need to live a fully open life, and there was no chance to reconcile them. The night before I left the village for the second time, Maame and I shared one last conversation. Every part of me wanted to come out to her, but for my safety and for her peace of mind, I did not. Instead we talked about our dreams. She told me she dreams of setting up a fruit stand in the center of the village, and making enough money to send all of her grandchildren to high school. Then she asked me if I still had the same dream – to come back to live in West Africa and help create opportunities for people like her. I looked at her, and then at the Human Rights Campaign mural I had painted on her wall, and I broke down. I cried for everything I wanted to tell her but couldn’t. I cried for knowing, at that very moment, that I would never be happy living in West Africa. I cried because I thought there was no way she could understand what I was going through, and that there was no way I could explain it. She wrapped her arms around me and squeezed tightly. I struggled through my tears to tell her that something had changed in my life – something I couldn’t tell her about – and that I didn’t think I would be able to be happy living in West Africa again. I started to apologize, but she stopped me. I looked up and smiled a little, knowing that she had just released me from my struggle.